For other uses, see Hard Rock Cafe (disambiguation). "Hard Rock Hotel and Casino" redirects here. For other uses, see Hard Rock Hotel and Casino (disambiguation). 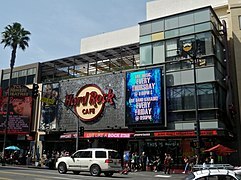 The first Hard Rock Cafe (HRC) opened on 14 June 1971 at Old Park Lane, Mayfair, London, under the ownership of young Americans Isaac Tigrett and Peter Morton. Hard Rock initially had an eclectic decor, but it later started to display memorabilia. The chain began to expand worldwide in 1982 with locations in (among others) Toronto, Los Angeles, San Francisco, Chicago, Paris, and Berlin. Hard Rock Cafe locations in the United States vary from smaller, more tourist driven markets (Biloxi, Pigeon Forge, Key West, etc.) to large metropolises (Houston, Philadelphia, New York City, Chicago, Boston, Washington, D.C., etc.). Hard Rock Cafe typically does not franchise cafe locations in the United States. All US cafes are corporate owned and operated, except for cafes in Tampa and Four Winds New Buffalo casino. However, in the transition of the Las Vegas Hard Rock Hotel property originally owned and then later sold to Rank by founder Peter Morton, Morton retained hotel naming rights west of the Mississippi. When Morton sold his Las Vegas Hard Rock Hotel to the Morgans Hotel Group, he also sold those naming rights, which then gave rise to two US franchised hotels (without cafes) in Albuquerque and Tulsa. The Albuquerque hotel no longer pays for the Hard Rock rights and reverted to its former name in June 2013. More hotels franchised from Morgan's are planned for Sioux City and Vancouver. In 1990, The Rank Group, a London-based leisure company, acquired Mecca Leisure Group and continued expansion of the concept in its geographic territory. Rank went on to purchase Hard Rock America from Peter Morton as well as Hard Rock Canada from Nick Bitove. After the completion of these acquisitions, Rank gained worldwide control of the brand. In March 2007, the Seminole Tribe of Florida acquired Hard Rock Cafe International, Inc. and other related entities from Rank for US$965 million. In 2008, anonymous members of the wait staff criticized the business because of its practice of paying them less than half the official minimum wage in the UK, with the business allocating tips to staff to bring their salaries within the law. Most customers, it was argued, do not realize that they are subsidizing a low wage when they give the tip. HRC is known for its collection of rock-and-roll memorabilia. The cafes solicit donations of music memorabilia but also purchase a number of items at auctions around the world, including autographed guitars, costumes from world tours and rare photographs; these are often to be found mounted on cafe walls. The collection began in 1979 with an un-signed Red Fender Lead II guitar from Eric Clapton, who was a regular at the first restaurant in London. Clapton wanted management to hang the guitar over his regular seat in order to lay claim to that spot, and they obliged. This prompted Pete Townshend of The Who to give one of his guitars, also un-signed with the note "Mine's as good as his! Love, Pete." Hard Rock's archive includes over 80,000 items, and is the largest private collection of Rock and Roll memorabilia in the world. Marquee pieces from the collection were briefly displayed in a Hard Rock museum named "The Vault" in Orlando, Florida from January 2003 until September 2004. After the closure, items were disbursed to various restaurant locations. The London Vault remains open and free to visitors, located in the retail Rock Shop of the original cafe. The Hard Rock Café is also in possession of a Bedford VAL 6 axle coach used in the 1967 film The Beatles Magical Mystery Tour. The vehicle was completely refurbished after filming. It is currently displayed in the US, but makes regular appearances in events in the UK, especially at the original Hard Rock Cafe in London. In 2001, a competition was run to win the actual bus, but it was never given away and remained with the cafe. In 1995, Peter Morton spent $80 million to open the Hard Rock Hotel near the Las Vegas Strip in Las Vegas, Nevada. A subsequent $100 million expansion in 1999 nearly doubled the hotel's capacity. In May 2006, Morton sold the Hard Rock Hotel & Casino, Las Vegas to Morgans Hotel Group for $770 million, including the rights to the Hard Rock Hotel brand west of the Mississippi, including Texas, California, Australia, and Vancouver, British Columbia. The hotel began another expansion in 2007 at a cost of $750 million. The project added 875 rooms in two towers and expanded meeting space. In March 2011, Morgans surrendered control of the property to partner Brookfield Asset Management, citing the high debt on the property in the face of the economic downturn. In April 2018, the Hard Rock Hotel in Las Vegas was sold to Richard Branson with plans to renovate the property under the Virgin Hotels brand. The Hotel Zoso in Palm Springs, California was converted into a 160-room Hard Rock Hotel and opened in 2014. A location in Atlantic City, New Jersey was planned, but canceled. All-inclusive resorts operate under the Hard Rock brand in the Dominican Republic and Mexico. In 2013, the Hard Rock Rocksino Northfield Park opened as a joint slot machine and track venture., near Cleveland, Ohio. Then in early 2019, it was announced that JACK Cincinnati Casino in Cincinnati was sold for $745 million to Vici Properties and Hard Rock International, with Vici acquiring the land and buildings for $558 million and Hard Rock buying the operating business for $187 million. Hard Rock would lease the casino from Vici for $43 million per year, and would rebrand it as Hard Rock Casino Cincinnati. Canada had numerous restaurants but many of them closed, notably the one at Yonge-Dundas Square in May 2017, which had been the chain's second location, leaving just two in that country, Niagara Falls, Ont., and the Hard Rock Casino in Coquitlam, B.C. In 2015, Hard Rock announced a new hotel in Bogotá, Colombia, which will open in 2019. The company had plans to open in the biggest financial district in Colombia, the Centro Internacional, but it revised those plans. The hotel will be located in the exclusive Zona Rosa de Bogotá, home of luxury boutiques. 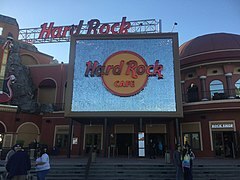 In March 2006, Hard Rock Cafe International announced that it had licensed the "Hard Rock" name to HRP Myrtle Beach Operations, LLC, to design, build, and operate a $400 million 150-acre (0.61 km2) theme park called Hard Rock Park. Hard Rock Park opened on April 15, 2008 in Myrtle Beach, South Carolina. The park was expected to draw an estimated 30,000 visitors per day, promised to create more than 3,000 jobs, and was billed as the largest single investment in South Carolina's history. It planned to feature a large concert arena and six zones with more than 40 attractions. HRP Myrtle Beach Operations, LLC, filed for Chapter 11 on September 25, 2008. The company hoped to re-open in 2009 after restructuring. On January 2, 2009 after failing to attract a buyer with a minimum $35 million bid for over two months, Hard Rock Park asked a Delaware Bankruptcy Court to convert the filing to Chapter 7, triggering immediate liquidation of assets to pay off creditors, and closing the park. New owners renamed the venue Freestyle Music Park and planned to reopen retaining a music-theme, but without the Hard Rock name, by Memorial Day, 2009. The park only operated one additional year and then closed, due to poor attendance. In August 2016, it was reported that the Miami Dolphins' stadium in Miami Gardens, Florida would be renamed Hard Rock Stadium. Super Bowl LIV will be held there on February 2, 2020. The Hard Rock Club is a sponsored bar at the Canadian Tire Centre, with Hard Rock branding and memorabilia. The stadium formerly housed Ottawa's first Hard Rock Café when it opened as The Palladium on January 15, 1996, and for many years when it was known as the Corel Centre. The café closed on August 8, 2002 and was replaced with the Frank Finnigan's restaurant. Since October 17, 2013, the restaurant is known as Chek Point, and is sponsored by SportChek. The Hard Rock Club bar was announced on October 9, 2018 and opened near the former Hard Rock Café. The bar features memorabilia from over a dozen artists, restaurant-style seating, and dedicated stadium seating. On December 7, 2006, Rank sold its Hard Rock business to the Seminole Tribe of Florida for $965 million. Included in the deal were 124 Hard Rock Cafes, four Hard Rock Hotels, two Hard Rock Hotel and Casino Hotels, two Hard Rock Live! concert venues, and stakes in three unbranded hotels. Rank retained the Hard Rock Casino in London, and rebranded it the G Casino Piccadilly. The Hard Rock Hotel and Casino in Las Vegas was also not part of the deal, as it was sold by Peter Morton to Morgans Hotel Group in May 2006. The final takeover was mired in controversy, due to a payment clause in a contract with one casino developer, Power Plant Entertainment. Power Plant and the Seminoles announced a settlement in April 2007 which both sides called equitable. On January 8, 2007, Rank shareholders approved the Seminoles' $965 million offer. The Tribe announced it had finalized the deal on March 11, 2007. On June 22, 2008, the Seminole Hard Rock Hotel & Casino Hollywood began "Vegas-style" table gambling in addition to the Class II slots already in operation. To win approval for the table games, which were barred under Florida law, the Seminole Tribe paid the State of Florida $100 million as part of a 25-year pact signed by Governor Charlie Crist. On July 3, 2008, the Florida Supreme Court ruled that the governor's agreement was unconstitutional, but table games continue to operate because the Federal Department of the Interior approved the now-invalid pact with the state. La Jolla United States Closed December 11, 1988 October 13, 2008 Originally San Diego, renamed when downtown location opened. Jakarta Indonesia Closed October 2, 1992 September 16, 2013 Relocated to Plaza Indonesia Entertainment X'nter in July 2004. It is currently located at Pacific Place. Ottawa (Kanata) Canada Open January 15, 1996 — Hard Rock Café closed on August 8, 2002. Hard Rock Club bar announced in 2018. Surfers Paradise Australia Open March 22, 1996 — Originally called Gold Coast. Ottawa Canada Closed June 26, 1996 September 1, 2013 Rideau Carleton Raceway to become Hard Rock Ottawa in 2021. Atlantic City United States Open November 15, 1996 June 28, 2018 Closed September 30, 2017 as part of the Hard Rock Hotel & Casino Atlantic City improvements plan. Restaurant originally opened as part of the Trump Taj Mahal, it remained open (independently operated) after the hotel and casino's closure until current round of construction began as part of conversion with its new owners. Relocated June 28, 2018. Seoul South Korea Closed December 2, 1996 Unknown Closed January 1, 2007. Reopened in April 18, 2008 but closed again in April 2009. Reopened in October 21, 2014. Fort Lauderdale United States Closed July 7, 1999 May 9, 2004 New location Hollywood, FL. Gatlinburg United States Closed September 5, 1999 May 18, 2014 New location Pigeon Forge. Detroit United States Closed November 10, 2003 January 26, 2019 Lease expired. Big Guitar Sign at Hard Rock Cafe, Beirut, Lebanon. This location closed in September 2013. Cleveland Hard Rock Cafe, closed since 2016. Hard Rock Cafe Roppongi, Tokyo. ^ a b "Seminole tribe in Hard Rock deal". BBC News. December 7, 2006. Retrieved March 16, 2012. ^ "Contact Us". Hard Rock Cafe. Retrieved July 25, 2018. ^ Seay, Gregory (December 14, 2015). "Hard Rock sets 170-room DoNo hotel". Hartford Business Journal. Retrieved December 15, 2015. ^ "Hard Rock History". Hard Rock Cafe. Retrieved March 16, 2012. ^ Shankleman, Martin (July 18, 2008). "Hard Rock wages 'below minimum'". BBC News. Retrieved March 17, 2012. ^ "Townshend's Gibson Les Paul". Hard Rock Cafe. Retrieved March 17, 2012. ^ "Hard Rock Corporate - Hard Rock History". ^ "The Hard Rock Vault". LostParks.com. Retrieved March 17, 2012. ^ Laura Porter. "The Vault". About.com. Retrieved March 17, 2012. ^ "The Hard Rock Hotel & Casino Las Vegas Selects Rainmaker Group Revenue Management". Hospitalitynet.org. June 22, 2009. Retrieved March 17, 2012. ^ Spain, William (May 6, 2006). "Morgans Hotel Group to buy Vegas Hard Rock for $770 million". The Wall Street Journal. marketwatch.com. Retrieved March 17, 2012. ^ Finnegan, Amanda (February 6, 2009). "Hard Rock Hotel expansion hits another milestone". Las Vegas Sun. lasvegassun.com. Retrieved March 17, 2012. ^ Green, Steve (March 2, 2011). "Hard Rock Hotel management group ends its run with resort". Las Vegas Sun. lasvegassun.com. Retrieved March 17, 2012. ^ "Business Mogul Richard Branson Buys Las Vegas Casino-Hotel". casinoreviews.co.uk. April 12, 2018. Retrieved April 18, 2018. ^ Milligan, Michael. "Sol Melia confident that ME brand will stand out from the crowd". Travel Weekly. Retrieved January 22, 2007. ^ "Hard Rock International and the Luckie Street Partners Announce Atlanta Hotel Development". Hard Rock Cafe. October 24, 2007. Retrieved March 17, 2012. ^ "Contact Us". Hard Rock Cafe. Retrieved March 17, 2012. ^ Vincent, Roger (February 10, 2013). "Palm Springs hotel to be converted into Hard Rock outpost'". Los Angeles Times. ^ "Hard Rock Hotel Palm Springs Announces Star-Studded Grand Opening Celebration Set for March 6th". GlobeNewswire. February 19, 2014. Retrieved November 10, 2016. ^ Wittkowski, Donald (September 13, 2012). "Hard Rock casino developers scrap Atlantic City casino project". The Press of Atlantic City. ^ Sarah Brookbank; Alexander Coolidge (April 5, 2019). "Hard Rock takeover gives Jack Casino a new owner, new name. What about a hotel?". Cincinnati Enquirer. Retrieved April 10, 2019. ^ a b "Vici Properties Inc. to acquire Jack Cincinnati Casino and lease to Hard Rock International" (Press release). Vici Properties. April 5, 2019. Retrieved April 10, 2019 – via BusinessWire. ^ "Hard Rock Entertainment purchases Turfway Park". The Blood-Horse. April 8, 2019. Retrieved April 10, 2019. 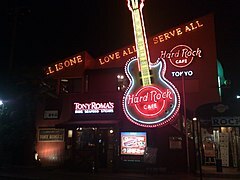 ^ "Hard Rock Cafe Legacy". CBC. Toronto. ^ "S.C.'s Hard Rock Park files for bankruptcy after inaugural season". USA Today. usatoday.com. September 25, 2008. Retrieved March 16, 2012. ^ "Hard Rock Park requests liquidation". Orlando Sentinel. Orlandosentinel.com. January 3, 2009. Retrieved March 17, 2012. ^ "Coastal business: Freestyle Music Park attorney sees better market". The Sun News. myrtlebeachonline.com. February 8, 2011. Retrieved March 20, 2012. ^ Jackson, Barry (August 16, 2016). "Miami Dolphins' stadium gets a new name: Hard Rock". Miami Herald. Retrieved August 17, 2016. ^ a b c Sens Communications (October 9, 2018). "Rideau Carleton Casino and Senators announce exclusive collaboration". NHL.com. Retrieved April 8, 2019. ^ Corel Centre (December 7, 2002). "Restaurants - Home of the Ottawa Senators Hockey Club (National Hockey League)". web.archive.org. Archived from the original on December 7, 2002. Retrieved April 11, 2019. ^ Lund, Chris (October 16, 2013). "Chek Point to open Thursday". NHL.com. Retrieved April 11, 2019. ^ Adrian Sainz (December 7, 2006). "Seminoles buy Hard Rock cafe". Seattle Post-Intelligencer. seattlepi.com. Retrieved March 20, 2012. ^ John Burstein (April 18, 2007). "Seminoles, developer settle disputes". South Florida Sun-Sentinel. sun-sentinel.com. Retrieved March 20, 2012. ^ "Seminole Tribe Finalizes Acquisition of Hard Rock International". PRnewswire. hotels-stl.com. March 11, 2007. Retrieved March 20, 2012. ^ Brenda Farrington (July 3, 2008). "Florida Supreme court nixes casino pact". The Seattle Times. seattletimes.com. Associated Press. Retrieved March 20, 2012. ^ Lesley Balla (January 8, 2007). "Hard Rock Café Ain't Rockin' No More". Eater LA. Retrieved March 20, 2012. ^ a b "Franchise Agreements Terminated". Hard Rock Cafe. Retrieved January 20, 2014. ^ "Memphis official confirms Hard Rock Cafe is moving its location". WorldNow and WMC. January 15, 2014. ^ Morona, Joey (July 23, 2016). "Hard Rock Cafe at Tower City closes for good on Sunday". The Plain Dealer. Retrieved July 24, 2016. ^ "Hard Rock Cafe Announces Move to Hakata - Fukuoka Now". ^ "Hard Rock Cafe Rocks New Hakata Venue - Pre-Opening Report - Fukuoka Now". April 26, 2016. ^ [>http://www.hardrock.com/cafes/cairo/ "Hard Rock Cafe Cairo - Live Music and Dining in Cairo - Cairo Restaurants"] Check |url= value (help). www.hardrock.com. Retrieved December 4, 2017. ^ "Το Hard Rock Cafe επιστρέφει στην Αθήνα". To Vima. Retrieved September 25, 2015. 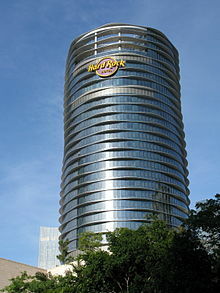 ^ "Re-Opening of the Hard Rock in Hong Kong". Next Stop Hong Kong. June 14, 2011. ^ "Hard Rock Turns Up The Volume In Florence With Grand Opening Celebration". Hard Rock Cafe. June 14, 2011. ^ "Hard Rock rocks its way to Hamburg" (Press release). 4Hoteliers.com. June 20, 2011. Retrieved March 20, 2012. ^ "Hard Rock Cafe Budapest Now Open". abudapest.com. December 21, 2011. Retrieved March 20, 2012. ^ "Hard Rock Cafe New Buffalo will have plenty to see (photo gallery)". MLive.com. ^ "Hard Rock Café Brussels location and opening hours". thomasvanhoutte.be. July 31, 2011. Retrieved July 31, 2012. ^ a b c d e f "Cafes Coming Soon". Hard Rock Cafe. Retrieved March 20, 2012. ^ "Job listing for manager of Glasgow cafe". ^ "Hard Rock Cafe Johannesburg". Facebook. ^ "Hard Rock Cafe to open in spring in downtown Anchorage". November 21, 2013. Retrieved November 21, 2013. ^ Glasser, Miranda (June 20, 2014). "Soft opening for Hard Rock Café". The Phnom Penh Post. Retrieved February 20, 2016. ^ "HRC Wien hat geöffnet". ^ "Hard Rock Cafe Mall of America". hardrock.com. ^ "El Hard Rock Café Asunción abrió sus puertas al público". ultimahora. ^ "Hard Rock Cafe Houston Airport - Live Music and Dining in Houston Airport - Houston Airport Restaurants". www.hardrock.com. ^ "Hard Rock Cafe Andorra - Live Music and Dining in Andorra - Andorra Restaurants". www.hardrock.com. Retrieved September 8, 2017. ^ "Hard Rock Cafe set to open eighth location in Kolkata". ^ "Hard Rock Cafe abrirá su segundo restaurante en Puerto Rico | El Nuevo Día". El Nuevo Dia. January 18, 2019. ^ ""HARD ROK KAFE" UMESTO "RUSKOG CARA" Na mestu gde je 122 godine bila čuvena kafana, biće otvoren objekat svetski poznatog brenda". October 25, 2016. "Seattle welcomes Hard Rock Cafe"